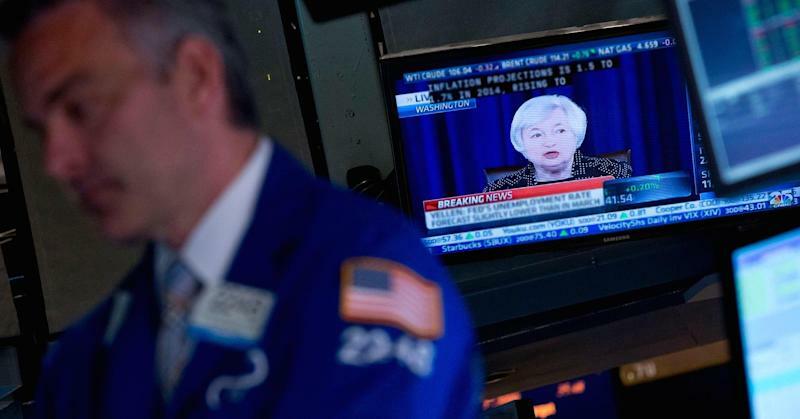 The Federal Reserve remained on its easy-money course Wednesday, allaying market fears that it might start raising interest rates sooner than expected. Chair Janet Yellen reiterated that any move in rates will be "data-dependent" on not based on a calendar projection. In a statement released following its two-day meeting, the U.S. central bank left largely intact key provisions, despite expectations in some quarters that it would indicate a tightening bias. It also cut its bond-buying program down to $15 billion a month and indicated quantitative easing will end in October. The Fed's Open Market Committee did not remove language that said interest rates would rise "a considerable time" after the monthly bond-buying program ended. Market fears centered over whether excising the language could have sent a signal that a rate hike would come as soon as six months later. The full sentence reads, as in the past: "The Committee continues to anticipate, based on its assessment of these factors, that it likely will be appropriate to maintain the current target range for the federal funds rate for a considerable time after the asset purchase program ends, especially if projected inflation continues to run below the Committee's 2 percent longer-run goal, and provided that longer-term inflation expectations remain well anchored." Responding to a question at a news conference following the statement release, Yellen said, "The committee decided that based on its assessment of economic conditions, that characterization remains appropriate and it was comfortable with it." Yellen also reiterated that any future decisions about rate changes would be "data dependent" and not necessarily based on a specific calendar target. That is significant because Yellen rattled the market in March when she said that a "considerable time" could mean a rate increase six months after the end of QE-putting a hike in March. "I know 'considerable time' sounds like it's a calendar assessment, but it is highly conditional and linked to the committee's assessment of the economy," she said. "It's kind of a shame that there's this obsession over what is minutiae further down the road," said Liz Ann Sonders, chief investment strategist at Charles Schwab. "The Fed is moving toward normalization. It will finish tapering next month and at the middle point of next year it will begin raising rates." Economic estimates from Fed officials changed little, though the so-called dot plot showed a growing gap between rate expectations from Fed officials and those priced in at the market level through fed fund futures. "There is too big a gap now between what the market expects for the funds rate and the path the Fed expects for the funds rate," Sonders said. "I would watch market expectations. Therein lies a potential trigger for the market that is more extreme than what we've seen." Stocks turned positive after digesting the Fed news. The U.S. dollar index gained while bond yields were little changed. "They are trying for a soft landing here," said David Kelly, chief global strategist for JP Morgan Funds. "The problem is they are a mile from the runway and they're at 30,000 feet and they've got to get monetary policy normalized more quickly and you can see this in how they are actually adjusting up their expectations for short-term interest rates and that should have an effect on market perception of where long-term rates are going to be." There was one additional dissenter for the September statement. Philadelphia Fed President Charles Plosser voted against the position in July, and he was joined this month by Dallas Fed President Richard Fisher. "President Fisher believed that the continued strengthening of the real economy, improved outlook for labor utilization and for general price stability, and continued signs of financial market excess, will likely warrant an earlier reduction in monetary accommodation than is suggested by the Committee's stated forward guidance," the statement said. The Fed's new policy guidance regime provided a more nebulous backdrop for how the central bank's leaders will proceed. "When economic conditions and the economic outlook warrant a less accommodative monetary policy, the Committee will raise its target range for the federal funds rate," the statement said. In reducing accommodation, the Fed will adjust the rate it pays on excess reserve balances, and will use overnight reverse repurchases on its $4.5 trillion portfolio. It also said it would reduce its balance sheet "in a gradual and predictable manner primarily by ceasing to reinvest repayments of principal and securities" it holds.